Chinese engineers are proposing a Moon rocket more powerful than the Saturn V of the Apollo missions and matching the payload of NASA’s planned Space Launch System (SLS) Block 2, the unfunded launcher that would put the U.S. back into super-heavy space lift. Drawing up preliminary designs for the giant Long March 9 launcher, Chinese launch vehicle builder CALT has studied configurations remarkably similar to those that NASA considered in looking for the same capability: to lift 130 metric tons (287,000 lb.) to low Earth orbit (LEO). One of the two preferred Chinese proposals has a similar configuration to the design finally adopted for SLS Block 2, though the takeoff mass for both CALT concepts, 4,100-4,150 tons, is greater. On that measure, at least, China wants to build the largest space launcher in history. Preliminary work is underway for the intended engines. At the Xian Space Propulsion Institute, engineers are certainly planning and probably doing risk-reduction work for a kerosene-fueled engine, apparently called YF-660, that would be comparable to the 690 tons thrust of the Saturn V’s F-1. 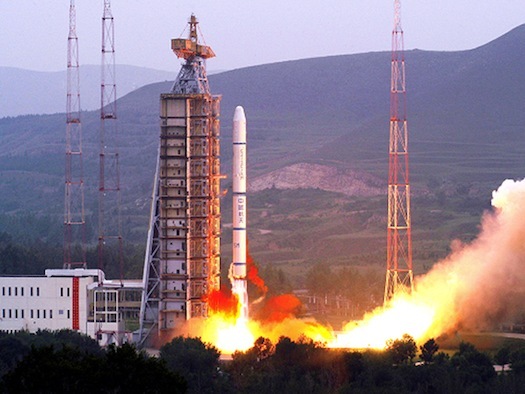 The Beijing Aerospace Propulsion Institute, meanwhile, is working on critical technologies for a 200-ton-thrust liquid-hydrogen engine that would be used for the first stage of one launcher design and for the second stage of both. That engine is apparently called the YF-220…. The Chinese industry is seeking permission to begin developing a Moon rocket. Studies encompass payloads as low as 70 tons to LEO, says an industry official, suggesting that China may follow the SLS concept by first building a smaller launcher adaptable to enlargement…. At the International Astronautics Congress, the Chinese industry showed a concept for sending people to the Moon with three launches via smaller rockets. A cargo launcher, perhaps a little sibling of Long March 9, would fire a lunar-landing craft into orbit around the Moon. Then a crewed capsule would follow on an even smaller launcher, presumably a Long March 2F or Long March 7, China’s current and future human-rated rockets, respectively. A propulsion unit sent on a second cargo launcher would join the capsule and propel it to lunar orbit, where it would meet the lander. Hmm, let them show up with their Long March 5 first… then we’ll see if they can every get backing/funding for this monster of a paper rocket! Nothing wrong with some long range planning. That’s probably the one thing we could copy from them after they’ve copied so much from everyone else. I’ll believe, when they pour concrete for HLV launch pads (I believe this was how we first learned of Russia’s N1 and Energia), or do large engine static firings. And even them I won’t necessarily worry. If China ultimately gets to the Moon in an Apollo-esq ‘sortie’ manner they can’t sustain any ore than we could, a year or so before we go back with the infrastructure to stay indefinitely, so what…? In my opinion the ONLY destination from (the surface of) the Earth should be Low Earth Orbit. And the only purpose of a Super Heavy Lift rocket should be to launch components that are too heavy and/or large to be reasonably assembled on orbit. Using SHL rockets to “go further” is a mistaken strategy. All you end up achieving is spending tens of billions on development and operation of occasional use rockets, to do what could gave been achieved with several medium-heavy lift launches and on-orbit assembly, at a fraction of the cost. If it costs $60million to put 10tonnes to LEO, then it costs $780million for 130tonnes to LEO; and also the risk of complete mission failure is spread across multiple launches that are easily duplicated. And at the same time costs are reduced and reliability is increased due to manufacturing savings and maturation of a frequently used launch system. Alternatively, using SLS as an extreme and unfortunate example, you could spend between $5billion and $14billion per launch for the purpose of putting all your mission eggs in one basket. Incidentally, cost is my main objection to LH2, besides the extra risks of hydrogen and added difficulty of handling a super-cryogen. Performance should not be the primary factor in rocket design, it should be cost. And an LH2 rocket is always going to cost more than a kerosene or methane rocket. We know that China have been practising on-orbit rendezvous and docking for space-station building, so they have the capability of assembling for beyond orbit missions. We will find out if China are able to learn and improve or simply copy parrot-fashion. My largest problem with the Chinese space program is one of simply a lack of operational tempo. Launching an occasional mission every couple of years is fine to show the flag, but getting to the Moon is going to require a much more regular launch schedule and getting some real experience in space. In other words, lessons learned are just as quickly forgotten. It is only when you get to apply those old lessons again and again that you eventually get to perfect how things should actually be working, as opposed to what some book says it should be doing. When you are playing with rockets, forgetting reality is something that often has deadly results. If the experience that the Soviet Union had with the N1 rocket is any comparison, scaling issues can really be a real problem. I agree the missions that will be interesting to watch the Chinese perform will be if/when they do a manned moon mission. How closely will they copy the Apollo architecture and mission format? Will they be able to “go any further” than Apollo by, for example, running a pair of missions simultaneously, to place four Taikonauts on the surface of the moon at the same time, or will they be able to do something like build a small temporary moon base? I am thinking of say, a couple of modules on the moon, and maybe a mission to take up the Taikonauts, a resupply mission whilst they are there and then the successful return of the Taikonauts. Maybe a month total duration. Alternatively, an Apollo style moon mission, but to a location where hardware has already been landed on the moon, so that the Taikonauts have more equipment than they could carry on their own lander. The USA had a lot of scaling issues in developing the F1 and flow lines in Saturn V. Once you understand what to look for it will not be as difficult, it will still be difficult. Inpresume that China wishes or as much glory as it can get. Repeating Apollo would only come across as having done something that America did decades previously. Rather, it would be too tempting to do the Americans one better. My thinking is that this would logically be a permanent base. This is simply done by not doing sorties to different locations but to the same location. If it was equatorial, then automated supply missions could give the frequency needed for the occacionally launched large rocket. If a polar base, then harvesting volatiles at high latitudes could mean a permanently manned base with occasional resupply. However, if COTS/CRS/CCDec is any indication, America could have the public-private programs to get companies to build a low-cost lunar lander and start their own permanent base at a cost that NASA could easily afford. You are accurately describing the Problem of _any_ government space program so far. You can’t really blame the Chinese for lack of tempo if the situation isn’t really that much different to the rest of the space faring world. Russia’s new programs don’t really go forward. ESA is crawling along at a pace that is hard to actually notice. The US is building a SHL rocket that will probably only fly once every other year (if at all). Without ISS as the focus point, there would probably not be any meaningful manned spaceflight happening in our time and the Commercial Cargo and Crew efforts would have no place to go.